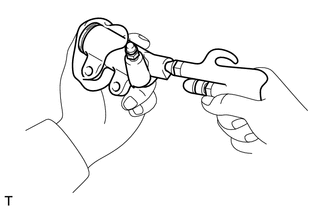 (a) Using a union nut wrench, disconnect the clutch release cylinder to flexible hose tube from the clutch release cylinder assembly. Use a container to catch the fluid. 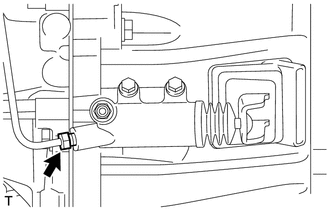 (a) Remove the 2 bolts and clutch release cylinder assembly from the manual transmission assembly. (a) Remove the boot from the cylinder body. (b) Remove the push rod from the boot. (c) Using compressed air, remove the piston together with the spring from the cylinder body. Do not damage the inside of the cylinder body. (d) Remove the 2 cylinder cups from the piston. 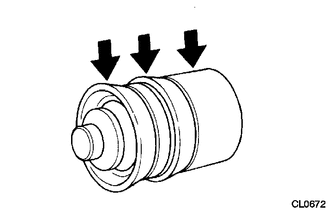 (a) Remove the bleeder plug from the cylinder body. 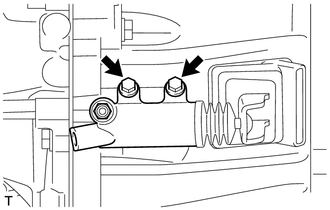 (a) Install the clutch release cylinder assembly to the manual transmission assembly with the 2 bolts. (a) Using a union nut wrench, connect the clutch release cylinder to flexible hose tube to the clutch release cylinder assembly. 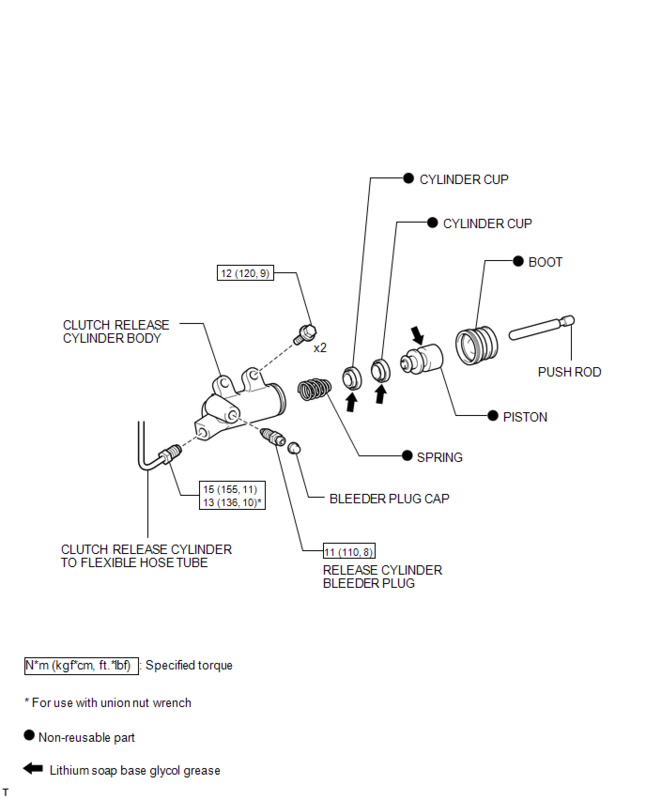 (a) Install the bleeder plug to the cylinder body. (a) Install 2 new cylinder cups to a new piston. (b) Install a new spring to the piston. (c) Apply lithium soap base glycol grease to the portions indicated by the arrows in the illustration. (d) Install the piston (with the spring) to the cylinder body. (e) Install the push rod to a new boot. (f) Install the boot (with the push rod) to the cylinder body.